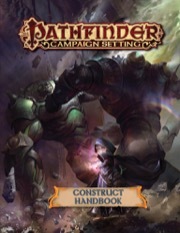 Pathfinder Campaign Setting: Construct Handbook is intended for use with the Pathfinder campaign setting, but it can be easily adapted to any fantasy world. Kill your PCs -- with SCIENCE! ...or horrible robots with chainsaws, which is a decent proxy for science. So, this is a GM-focused book, but with a bit of PC material. The first three chapters are fairly quick, covering general construct construction, archetypes, and magic items. By and large, this section is decent but not exceptional. A few good archetypes (I particularly like the Construct Caller Summoner and the Voice of Brigh Bard), some interesting items (an Automaton Core is a minor artifact with actual methods for PCs or NPCs to get, if they're not very nice), and a bunch of golem manuals. The meat of the book is the fourth and final chapter, which occupies 2/3rds of the page count. And this has some beauties. First up are the Automatons, which are my new favorite thing in Pathfinder. Short version, in ancient days the Jistka Imperium was waning, and so as a way to preserve it some of the elders of the Imperium started uploading their citizens minds into thaumaturgical robots. Thus you have the living constructs known as Automatons, ranging from the adorable and familiar-grabbable Familiar Automaton to the mountain-shredding CR 20 Master Automaton. These guys have everything. Imposing stat-lines, gorgeous art, fascinating backstories, oodles of plot-hooks... you want it, you got it. There are a bunch of new robots, golems, and clockworks. The stand-out here is the CR 17 Gladiator Robot, which is what happens when you give a hyper-effective killing machine a chainsaw and a directive to please the crowd. This thing is basically a slasher movie villain, and thus awesome. At the other side of the spectrum is the Clockwork Goblin, which is small and silly and kind of adorable. Finally, there are templates, a half-dozen of them. Golems wreathed in caustic mist, constructs haunted by ghosts, constructs with artificial psychic minds, constructs with someone else's brain stuffed into them, commando constructs (as scary as they sound), hilarious malfunctioning recycled constructs, and the most awesome, steam-powered mechanical dragons. Allow me to repeat: steam-powered mechanical dragons. Conclusion: This is a GM book primarily, though a few of the archetypes are nice for a PC. It is a very good GM book, useful if you want any kind of constructs in your game. I was incredibly excited when this was announced last year, as I love constructs and playing characters who make them, however this was mostly a letdown. Most of the archetypes are just terrible, some like the Paladin one are unbelievably bad, trading away class abilities do something the altered/ruined smite already does. The Wizard one trades away all bonus feats among other things, in return for...a bonus feat. And +50% cost/time to every construct they ever make. Truly amazing. The bard archetype however I will say was very interesting, though it's weird they gave bards the new way to reanimate constructs. Alchemist can now kill themselves as an immediate action, so that's great. 1 con drain to heal a homunculus 1d6HP per drain. Phenomenal. Additionally, in combat healing of constructs is still at the same awful level it's always been at. Fast healing 5,and 10 minutes of greater mending. Have fun. The one good thing to come of this book are some of the new Templates for constructs, but most of the interesting ones are priced high enough as to mostly be DM territory. Steam was great though, as was the repaired one. Somewhere between 1-2 of 5 stars, but we round down in Pathfinder. While it presents a number of construct related character options, it doesn't really make coructs any more accessible for PCs; you still need to be quite high level and exorbitantly rich to really get into them. Those who thought they would finally be able to march their golem army like the necromancer's shambling horde or the conjurist's heavenly legion are going to be disappointed. A good chunk of the book focuses on Shory constructs. An interesting bit of lore, but one ultimately tied to artifacts, making following in the Shory's footsteps a thing that serves best as a campaign focus rather than a PC option in any existing Adventure Paths. That said, they are pretty cool. The character options for construct flavored characters are...well, lukewarm. There are better options in a number of preexisting books. All in all, good for a GM or if you REALLY want to make a golemmancer. If you have a casual taste in constructs, I can't really recommend. I will readily admit that I'm usually rather hard on Paizo with my reviews. But I have to say that I generally liked this book. I was hoping for options like ways for your character to become a construct over time--piece by piece. Or something that lets you merge with a construct similar to the Synthesist Summoner. Sadly, no such options included. Overall, it's got a lot of constructs as monsters in it, has a good amount of flavor text about creating them, some options on improving them, and some archetypes around either building or fighting constructs. Of the archetypes included, there are a bunch of bad ones, a few moderately interesting ones, 1 that is horribly written as to be contradictory (at least, it seems that way) and a couple that are actually pretty good. The Construct Saboteur gives some good options for rogues. The shining star is the Voice of Brigh bard, though. I really want to find a way to switch my character in Iron Gods into one of these. Unexpected, but far from unwelcome. This may have role in my plans somewhere. I cannot tell you how long I've been waiting for a book like this to come out. Here's hoping it plays nice with alchemists that took that one discovery to let them make constructs. What I really meant was that we already have rules to create robots out of other constructs, but not out of other corporeal creatures. It's easy to see why it fits the Campaign Setting line better. It isn't centered or limited to PC options and we are probably getting lots of GM content to create constructs unique to our settings. Maybe there's also a lot of flavor texts, just like a revisited book. For November, I was expecting something that would lead us into the next Adventure Path. A regional book, the next unleashed/revisited book or even another book for one of the realms. As I really like constructs and do think that player have a small number of options on how to use them - at least less than I would like - I'm really happy with this book. Maybe its too early for the next Pathfinder campaign setting book, and by that I mean a book about something strongly related to the setting. I'd love to play a character that was similar to a summoner with eidolon but was more of a Alchemist or wizard with construct. Sort of a character that was constantly fiddling with creation. His construct would evolve with upgrades. Ah, nice. My favorite golem is the Alchemical! Love the weird look and random bombs. Now this is something unexpected. I highly approve. I have to second all the 'this is unexpected' reactions. Still, construct fans will surely be delighted. It will be interesting to learn just what nations/regions on Golarion are more construct-heavy than others. It is interesting that this is a campaign setting book. It'll need lots of construct stats, so it's probably still the best line for it. Constructs are a weird player/GM intersection. How many pages will this book have? Except in rare circumstances (a few hardcover books the 96-page Inner Sea Faiths), our Pathfinder Campaign Setting line has involved 64-page books. I'd like to see rules about creating intelligent constructs, perhaps something on par with intelligent items. Will this book have stats for new and/or variant constructs? Will we see anything about the clockwork cathedral in this book? Yes, I've been waiting for this. We've been sorely lacking in additional / variant rules for construct building as well as additional options to use in their construction. I wonder if this manual will settle the question on whether it's morally okay for good-aligned spellcasters to make use of elemental spirits to empower golems though? Going to have to take a think about whether it's worth the hassle to cancel my subscription for one month in November. Not the kind of book I'm interested in when I buy things in the Campaign Setting line. i hope they include salvage rules for destroyed constructs, recycle /waste not want not. different construct building legacys types such as clockwork, dwarven, druidic/fey , demonic/hellish/cheliaxian ,gnomish ,aztalani and undead constructs. Hopefully maybe a conversion to pathfinder of the 3.5 ebberon artificer class. Would like to see a wizard archetype that trades in Arcane Bond for a construct minion that scales as if an Animal Companion. Perhaps Knowledge Arcana should be used to push in the same way that Animal Handling is? Well if they gave a wizard a construct minion that scales as an animal companion, they would have give up more then just arcane bond...a lot more. I love crafting. Not like H.P. but more like H.P. In a world where magic can solve literally every problem, it seems like a magic creator would do exceptional business. It seems like Golarion treats these folks as finger-waggling nerds or pious conduits or bestial drunkards who dabble in making baubles or trinkets. I would love to play a character that makes widgets. Let's take a toaster for example. I don't want to spend my time studying whats-its or praying to whose-its or guzzling brews-its to build a toaster. I want a character that applies trial and error to toaster building, adds in a bit of world-magic or god-magic or booze-magic and boom! Toaster complete! Let's get more practical: In the real world potable water is a big problem. There is a divine spell that purifies food and drink. Cool. What if I made my own reverse-osmosis water purification unit? What if I took high pressure water, a double-baffle filtration system, and the impurities made their way out of my drinking water. That gadget would be amazing! The technomancer takes over the machines of somewhere else. Cool! How can that become an innate part of Golarion, with characters making the machines (or tools, or magical effects, or transportation, or you name it) as a fundamental aspect of the class. Can we get a class or prestige class dedicated to crafting? Is that possible? I know the Artificer from Eberron is not close to OGL, but the concept is pretty straightforward. A widget-maker. Why do I have to study all these other things, or pray to some deity, or be possessed by infernal blood to make a widget? The investigator takes a very direct approach to science, study, and practical application. Is there room in the game for a Creator class? This is probably a terrible place to channel my enthusiasm, but I really would like it to work. I know it's incompatible with PFS on a variety of levels, but the modern world celebrates inventors. Thomas Edison has had global impact, and the Wizard of Menlo Park (purportedly) didn't have any magic! What could be done in Golarion? and so on, to make more variants possible. At the very least this book should include an updated and holistic list of all of the qualities an Animated Object can purchase with their Construction Points. A few more Construct Modifications wouldn't hurt either. Really though I just want rules for constructing and piloting a 50-foot tall Eveng-I mean "Animated Object"... I.E. we need a Cockpit Modification that subjects the construct to an effect similar to Possession. When the description mentions "variations and modifications", does that mean we get some stat blocks? What I mean is don't make constructs available to players so nerfed. I played the above prestige class and I think I had to be 10th or was it 12 th level or higher to get that class. The gondsman class feature was so badly nerfed. The upgrades for it so pitiful it was not worth taking imo. My Dm allowed me to change classes when the Gondsman was destroyed by a pit trip. I'm not saying offer broken options. Just make sure the crunch matches the fluff. I wonder why this a campaign setting book. Because it is probably more for creating interesting opponents for players than necessarily allowing players lots of construct options. The construct builder feat was in the bestiary after all. Because constructs are generally intended to be creatures you fight or tools used by GMs for adventures; that's why "Craft Construct" appears in the Bestiary, not the Core Rules. Player characters CAN build them, but this is generally a "Get permission from the GM first" rather than a core assumption that's always available. Plus, with the Campaign Setting line, we get twice as much room to conver the subject, and can put in a LOT more flavor and world lore. Well since it is a campaign setting book doesn't that mean it will cover specific places in Golarion that dealing with constructs? i don't know. being an android that is constructed and a construct are not exactly the same thing. but if their are, i am sure that there will be at least one that has you trade out your limb or hand for some form of weapon. Kind of like in blood will tell, a game based on a manga where one of the main characters is a ronin that has had all of his body parts replaced with substitutes after they were stolen by demons to fulfill the dark cost of a bargain made by his father. Maybe I just like the idea of asking the gm after my character loses an arm, "so how much money do i need to get a robot arm that has a culverin or smaller firearm built in to it. if not, when might i have the chance to have my arms replaced with a blade built into them."